1. The anticipation and excitement that comes with Opening Day make it almost impossible to not overreact, whether it’s to something bad or something good. Any reasonable baseball observer knows what happens only matters as much as any single game can. It’s an oft-repeated sentiment: It’s just one game. It’s a long season. Small sample sizes. Etc. It doesn’t matter. We know in our well-conditioned brain that in a few weeks or a month, what happened Thursday isn’t going to be fresh in our memories, and there’s a good chance whatever the outcomes of those games are going to have very little bearing on how these teams and players are performing in Game 31 or 62 or 100. But we react to the good and the bad with a level of excitement that isn’t seen for most median regular season games, because it’s Opening Day. It’s exciting. After five months, baseball games matter again. The White Sox 14-7 victory over the Royals didn’t follow any typical script. The White Sox hit six home runs — three by Matt Davidson, two by Tim Anderson, and one by Jose Abreu — in coming back from an early 4-0 deficit to wallop a division rival. All three of Davidson’s bombs registered at a higher mph than any one he hit last season, per Statcast, and he became the first player in the Statcast era to hit three home runs that all registered faster than 110 mph. It was the kind of performance that’s easy to dream on. No, the White Sox are going to average 14 runs per game. They probably won’t set a major league record for home runs in a season. And I’m not holding my breath waiting for the next time James Shields goes through a stretch of retiring 16 of 18 batters without allowing a base hit in that span. But it’s the only game in which we have to judge, and for one game, the White Sox were both victorious and fun as hell. 2. Just as we overreact to the good, we overreact to the bad, and Shields getting tagged with four runs before recording an out zapped the Opening Day excitement almost immediately, as we were quickly hit with the harsh realization that, yes, baseball is back, but the struggles that have made Shields a shell of the pitcher he once was were still there. Shields bounced back, as I mentioned, but he did not get out of the final five innings unscathed without a bit of luck. He generated just four swinging strikes all afternoon and zero strikeouts. In fact, White Sox pitching didn’t record its first strikeout until Luis Avilan got Jorge Soler swinging in the eighth inning. Still, after that first inning, the Royals didn’t generate much hard contact. They put seven balls in play with an exit velocity of 100 mph or more, according to Statcast, and five of those came during the first inning. Shields is going to be walking a tight rope between competence and combustion all season long. Getting through 6 innings was a coup for the White Sox considering the first inning, but one would imagine the batted ball luck and run support won’t always be there. 3. The five combined homers by Davidson and Anderson were the obvious highlights in the 14-run explosion. Davidson’s power isn’t surprising, but a strong start to the season would be a boost for a player who is undoubtedly trying to prove he belongs on a major league roster. Davidson could hit 40 home runs this year, as Paul Konerko has said, but for someone who won’t provide much if any value defensively, the key for him will be evolving his skills beyond that prodigious power. We’re talking, after all, about a player who was a net negative across the board last season despite 26 home runs in 443 plate appearances. Davidson had two plate appearances Thursday in which he didn’t leave the yard. In his first at-bat, he worked the count full (good) before swinging at two pitches that would’ve been ball four (bad), ultimately flying out to right field. In the other, he watched six straight pitches and drew a walk. Having at-bats like that, to go along with the power, will go a long way for a player whose 4.3 percent walk rate would’ve ranked in the bottom 10 in the league last season if he had enough plate appearances to qualify. 4. Speaking of walks, Anderson took one as well in one of his three plate appearances where he failed to dinger. Even more than Davidson, the base on balls is noteworthy for a player who walked just 2.1 percent of the time last season, dead last in the majors. Anderson didn’t draw his first walk last season until the ninth game of the season and drew just 13 total in 606 plate appearances. Unlike Davidson, success for Anderson isn’t wholly dependent on the 24-year-old turning into a more patient hitter. His two homers Thursday were a good sign, as him living up to his power potential combined with his speed and hopefully improved defense at a key position (he was initially charged with an error on a tough play in the first inning but it was later turned to a hit) would make him a valuable player even if he always hovers near the bottom of the league in walk rate. 5. The White Sox drew seven walks Thursday, including two each from Nicky Delmonico and Adam Engel, the latter of whom added two hits on the day. 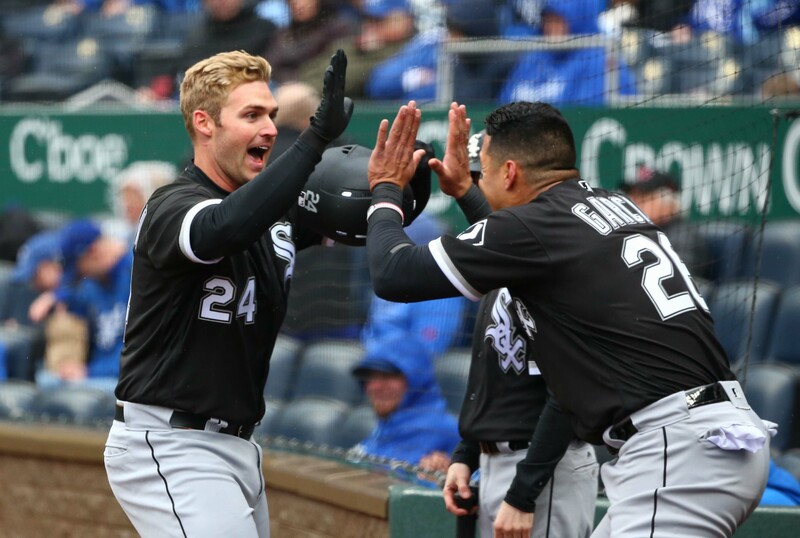 Those two, along with Davidson and Yolmer Sanchez, are the White Sox biggest question marks from a positional standpoint this year, so a good start (I know, it’s one game) is good to see. But in general, the White Sox taking walks is a welcome sight. They were 28th in walk rate a year ago, ranking slightly ahead of Detroit and Baltimore in that department. Danny Duffy and the Royals’ bevy of anonymous relievers isn’t exactly the stiffest competition, but the White Sox showing more patience as a whole — not just Davidson and Anderson — would be considered a big step forward for a team still ripe with developing young players.